Chosen by the Dallas Cowboys in the first round of the 1965 NFL draft (he was chosen by the Raiders in the AFL), Morton saw limited action as backup to Don Meredith for four seasons before taking over as the starting quarterback in 1969. A classic dropback passer with a good arm and limited mobility, he threw for 2619 yards and 21 TDs while averaging a healthy 8.7 yards per attempt in ’69 and in 1970 the Cowboys won the NFC Championship as Morton led the league with 8.8 yards per attempt. However, he had a rough outing in the Super Bowl loss to the Colts and then lost the starting job to Roger Staubach during the ’71 season. He stepped in when Staubach went down with an injury in 1972 but went back to the bench until he was traded to the New York Giants during the ’74 season. While expectations were high, the Giants were mediocre and Morton took a beating, tossing far more interceptions (49) than touchdowns (29) over the course of 34 games, only 8 of which were wins. Following the 1976 season, he was traded to the up-and-coming Broncos. Broncos went 12-2 to finish first in the AFC West with the conference’s best record, achieving the first postseason appearance in franchise history. Won AFC Divisional playoff over Pittsburgh Steelers (34-21) and AFC Championship over Oakland Raiders (20-17). Lost Super Bowl to Dallas Cowboys (27-10). 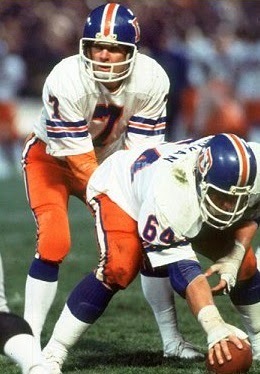 The Broncos topped the AFC West again in 1978, but Morton had a lesser season and split time with backups Norris Weese and Craig Penrose. The team had trouble putting points on the board in ’79, with Morton again seeing most of the action behind center, and while his passing yards (2626) and touchdowns (16) went up, so did his interceptions (19). Matt Robinson was obtained from the Jets to challenge him in 1980, but Morton regained the starting job and, with the arrival of ex-Dallas teammate Dan Reeves as head coach in ’81, he enjoyed a revival as he achieved a career-high 3195 passing yards and tied his previous best with 21 TD passes while averaging 8.5 yards per attempt. But it was a last hurrah as he finished out his career in the strike-shortened 1982 season. Overall, Morton passed for 27,908 yards and 183 TDs, with 187 interceptions, over the course of 18 years in the NFL. 11,895 of the yards and 74 TDs came with the Broncos, where he enjoyed his greatest success and became part of that team’s Ring of Fame in 1988.